Plan to bring a great book or two for your afternoons in the sun. High ceilings and plenty of windows give the indoor pool area an airy, open feel. You're right on beautiful Table Rock Lake. Nothing gets the kids out of bed faster than a short stack. Close to Silver Dollar City and World's Largest Toy Museum.. Located 4 miles from Kimberling Golf Course. 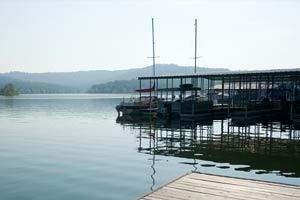 A wooded wonderland surrounded by Table Rock Lake, The Village at Indian Point is a crowd-pleaser. Go for a swim in the outdoor pool, or lounge poolside while the little ones splash around in the children’s pool. The heated indoor pool will come in handy in the cooler months. Choose from indoor and outdoor hot tubs, plus an infrared Signature Luxury Sunlight Sauna for the ultimate in relaxation. When it’s time for lunch, look no further than the bbq grills for a fun family cookout. Now the only question is: burgers or hot dogs? Let the kids try their hand at fishing – children’s poles are complimentary down at the boat dock. If they’re looking a little too pink-cheeked, head for the arcade-style game room or the shaded on-site children’s playground tucked under the trees. Look for the beautiful hiking trails across the property, or hit the fitness center if that’s more your speed. With all of this, it’s no wonder that The Village at Indian Point was awarded a TripAdvisor Certificate of Excellence seven years in a row! Air-conditioned one- to two-bedroom condos sleep four to six guests, are individually decorated and have in-suite fireplaces. Full kitchens have plenty of “secret” snack space in the way-way back of the cabinets. In-suite washer/dryers allow you to pack light and save room in your suitcase for souvenirs. TVs have premium cable and DVD players. Rent DVDs for just a dollar (there are seven-hundred titles available at the resort), and keep watching until everyone is zonked out. For more space and an in-suite jetted tub, upgrade to a deluxe or luxury two-bedroom condo. Luxury two-bedroom condos with a loft sleep a total of eight guests. Who doesn’t love a good deal? Be sure to ask the front desk about discounted tickets to Branson attractions, including two days for the price of one at Silver Dollar City. Chances are everyone will want to go back another day anyway. This family theme park has over forty rides including Outlaw Run, “the world’s most daring wood coaster.” Join the only certified zipline guides in Branson at The Branson View Zipline, on six flights over the Ozark Mountains that overlook the famous 76 Strip. Dolly Parton fans will enjoy the Dixie Stampede Dinner Theater, where you can have a four-course meal while watching a horse show in a thirty-five-thousand square-foot arena. The Titanic Museum features actual artifacts from the ship as well as a replica of the Grand Staircase. Learn about the victims and survivors during this interactive experience that includes self-guided or private tours. Please keep in mind that this experience may be too intense for young children. - Front desk is open 9:00 AM - 5:00 PM daily. Guests that are planning to arrive outside the normal front desk hours must contact the property in advance using information on the booking confirmation. Guests can pick up an envelope with keys to the unit upon arrival once confirmed with the resort. Minimum check-in age is 24. Indian Point is Branson's largest resort area. Don't forget to visit Silver Dollar City, Branson's theme park for family fun. Indian Point is close enough to enjoy all the entertainment that Branson has to offer but far enough away that you won't be bothered by traffic.